On a warm September evening members of Rocky Mountain College’s Services for Academic Success (SAS) program eagerly waited in their seats at the Alberta Bair Theater. All attendees, including myself, experienced two unique and beautiful art forms: music and dance performed by the Billings Symphony Orchestra and the Grand Rapids Ballet Company. Top Row: Lindzy Thomas, Terry Anthony, Taisha Rocha, Jordyn Walter, and Jacob Buffington. Bottom Row: Jocelyn Anderson and Megan Logan. photo courtesy of Rebecca Hall. 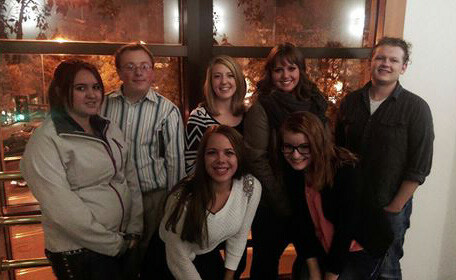 Typically, students of the program attend cultural events on their own. However, SAS Advisor Taisha Rocha rallied a group of members together who shared her interest in the symphony. While we were driving to the theater, we discussed our excitement and anxiousness. The women’s heels clacked on the pavement and somehow made me more enthusiastic about the symphony than ever before. The brilliant pink and orange sunset provided a warm welcome to a fun and memorable evening. As I sat in a red-cushioned seat in the balcony and listened to Tchaikovsky’s Swan Lake and Gershwin’s Who Cares, I could not help but smile. The conductor gave cues with intense purpose, the orchestra played their instruments with incredible passion, and the ballet danced with the utmost grace. As I absorbed all that was happening onstage, I couldn’t help but think of how lucky I am to be given opportunities such as this. Attending these events would not be possible without SAS. For Rocky students that come from a low income background, are first-generation college students, or have a physical or learning disability, certain opportunities are offered by Services for Academic Success. Some of these opportunities include tutoring, counseling, and scholarships. SAS also offers cultural and academic enrichment opportunities—such as attending the performance of the Billings Symphony Orchestra and the Grand Rapids Ballet Company. Before the concert started, all subscribers, or sponsors, of the Alberta Bair Theater stood up to be acknowledged. The last man standing has been a subscriber for over fifty years and all attendees applauded him with great respect. Seeing that this man and well over half of the audience is involved throughout the community in such a unique way was incredible. As I sat in the car on the way back to campus, I realized that SAS helps students to become culturally involved like all of those subscribers. It is not just another program here at Rocky. The program and the advisors are truly dedicated to making sure that students grow academically, socially, and culturally. The SAS office, which is located in the Fortin Education Building, is full of information pamphlets that encourage healthy lifestyles through staying well, being active, sleeping well, connecting with others. As I enter the SAS offices, I am always greeted with smiling faces. Their care is so genuine and is truly outstanding. Each time I walk out of their door, I am inspired to help and encourage others in the ways that SAS has done for me. In my short time of being a member, I have matured thanks to the SAS staff and the wonderful experiences they provide. I am thankful to be part of something so special.